"A" can be for Arlee--that's me!--but better yet "A" is for A to Z Challenge. 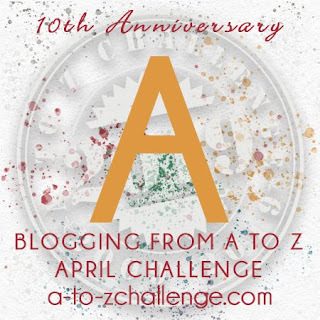 Since this is the opening post at the A to Z Blog for the 2019 Challenge I'd like to welcome everyone who is joining us as a participant or as a supporter reading our posts. A to Z is mostly about fun, but it can help bloggers in many ways. Whether you are reviving a dormant blog or building content for an active blog, you can probably think of many good reasons to participate. You might even end up with a book compiled from your April posts! So let's dive into the alphabet for the month of April. Visit as many A to Z posts as you can each day and leave comments so that those bloggers will know you stopped by. If you haven't prescheduled your posts, don't get stressed--keep your posts short so you don't tax yourself as well as overburden your readers. But that's my suggestion and it's your blog so you know best about your situation. No matter how you approach A to Z we want everyone to have a great time. Hi Arlee! Last time for me was 2016 and I did make a book for my theme 'Lessons Learned'. Now I'm back! See you along the way! Guess I missed out. Bummer. I thought April 6th was the last date. That will teach me to be overworked, right? Well, it will save me some writing! I am so thrilled to be doing this again. It has been a few years. I made fun contacts and friends on previous A-Z challenges. I'm getting pumped for this challenge! !0 years of A to Zing - Congratulations! Delighted to be participating this year on your 10th Anniversary, Let's have a wonderful April. So good to be here again, 5th year in a row. I am worried. The post is from April 1, and the comments show April 1, but I don't see the link to put our own April 1 (A) posts up. Will it be a new post on what is April 1 where I live? It's still March 31 here! Good luck to all participating in the challenge! Enjoyed my years participating in the past but life is way too busy to do it these days. You should still be able to get on the list. Congratulations on 10 years. Sorry I can't take part this year. Hopefully I will, next year. Congrats on the tenth anniversary! Here for my sixth time. Happy A-Zing! where do I post? confused. I did it in 2016 and really liked how productive it made me. So I’m doing it again. I’m excited to see what everyone comes up with. Congrats on the 10th anniversary. Back for my 5th time. Good luck to all taking part. Arlee Bird, darlin'! I'm thrilled to join you again for another year of A2Zing. This is my 7th year and I am eager to enjoy the fun again. Let me say thank you to you and all of your lovely hosts. There's a lot of work with keeping this blogfest floating each year and I for one don't know how y'all do it, especially you the Brain Child behind this madness but you do. As I signed up for the master list yesterday only, I missed signing up the spreadsheet for Theme Reveal post... Can you suggest an alternative? This is my 3rd time. Excited to be participating again! Today, in celebrating the 10th Anniversary of In The Eye of The Beholder, we have A is for Angel. Yeah so glad it started! How do I allow comments? Was told to not allow when I signed up. Back again for more! This challenge is always a blast. Did I miss it, or is there not a daily spreadsheet this year? Thanks for all the work of hosting it! So fun, thanks for hosting this fun challenge! My third year with #A2Z and still the same feeling of excitement! I stumbled upon this challenge a few years ago when I was actually an active blogger, but never participated until now! And with two brand new blogs! Hello All! Enjoyed writing my first post for the challenge. Please do stop by - https://anjus.home.blog/2019/04/01/alphabet-a/ and let me know your thoughts. Congratulations, Lee on the 10 year anniversary. Wow, I’m beginning to feel old. I’m giving it another go this year. I hope I’ve figured out my blogger comment issue. Why do they keep changing everything? Have fun. Happy ten years and so glad to be back! Congratulations. I am giving it a try this time.If time permits I can reach the goal post. Thank you for the opportunity. My first post...A free verse. A little late to the party but I want in on this one, too, with a dormant blog relaunch. IT's wild that it's the 10th anniversary! 10th Anniversary wishes. Kudos to the team. Blog tours are a tool I definitely don't utilize enough. Thanks for the great tips! This is my first year taking part. Last year I enjoyed other people's posts and decided I wanted to join in. So her ei am. My link for "A" is behind but is below. Even though I was unable to read/comment until today (Disney vacation and family visit), I am so pleased to have been able to participate again. This is always a great writing exercise for me as well as finding new blogs to follow.